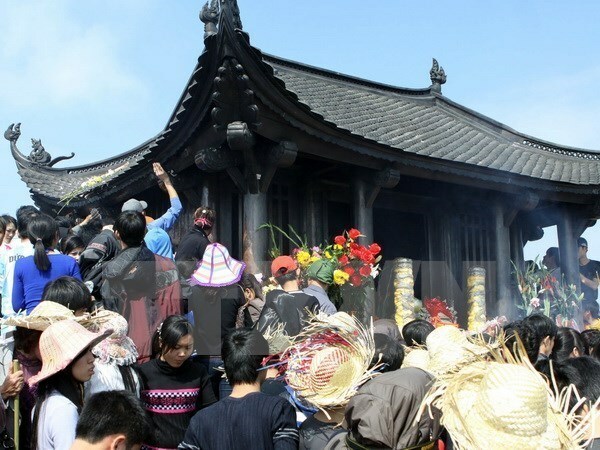 Quang Ninh​ (VNA) – The Yen Tu spring festival officially opened on February 17, the 10th day of the first lunar month, at the Yen Tu historical site, Thuong Yen commune, Uong Bi City in the northern province of Quang Ninh. The event saw the participation of Vice President Nguyen Thi Doan, and crowds of Buddhist followers and visitors. Numerous activities were organised during the opening ceremony, including traditional rituals and art performances. The festival takes place from the 10th day of the first lunar month and lasts till the end of the third lunar month. Yen Tu Mountain is located about 50 kilometres from Ha Long City. The area has a beautiful natural landscape and awe-inspiring scenery, surrounded by ancient pagodas and hermitages. The pilgrimage route, which winds from the foot of the mountain to its pinnacle, is almost 30 kilometres. Dong Pagoda, which sits atop the mountain’s highest peak, is more than a kilometre above sea level. In the 13th century, King-Monk Tran Nhan Tong (1258-1308), the third king of the Tran dynasty, abdicated the throne when he was 35 and spent the rest of his life on Yen Tu Mountain, practising and propagating Buddhism. He founded the first Vietnamese School of Buddhism called “Thien Tong” or Truc Lam Yen Tu Zen on the 1,068m-high Yen Tu Mountain. The 20,000ha site is considered the capital of Vietnamese Buddhism. Besides numerous temples, it also preserves many old religious and cultural documents such as precious prayer-books and monks’ writings.